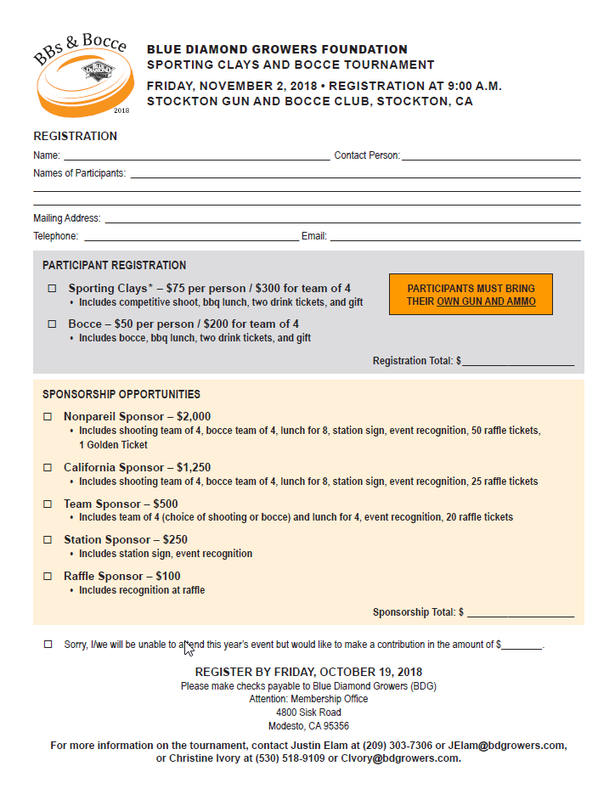 On Friday November 2, 2018 we will be hosting the Inaugural Blue Diamond “BB’s & Bocce Tournament” at the Stockton Gun & Bocce Club. We are creating this opportunity to bring Blue Diamond Members and Industry Associates together to celebrate the end of harvest and to raise funds for the Blue Diamond Growers Foundation. The Foundation’s focus is to support California students attending or planning to attend a college offering a 4-year degree in Agriculture. By creating this event we hope to raise more money for the foundation to provide scholarships to the future leaders of our industry. Please join us for a 12 station shoot or team bocce tournament. There will be excellent prizes for the winners along with bragging rights. Lunch, drinks and a raffle will also complete the day. We look forward to your help in making this a successful event and we can’t wait to see you there! Attached is the registration form with the sponsorship opportunities available.